Turning Point Trust's annual exhibition, which coincides with Mental Health Awareness Week in October, has turned into a regional event. Recycled Relics focuses on retro craft like knitting, embroidery and apron making. “Now that these artworks have made a comeback, we get people travelling to the exhibition from left, right and centre,” says Arlene Foster, Turning Point’s General Manager since 2002. Recycled Relics has been running for the past six years. It is one of the ways that Turning Point maintains its involvement with the wider community. 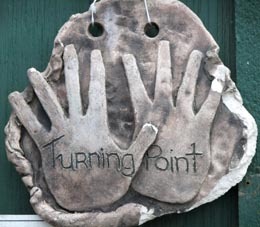 Turning Point Trust was established in 1996. A mental health recovery centre, it offers a range of activities and vocational services for people living with mental illness and is located in the Historic Village, a community and arts hub in Tauranga. “Our vision is to be a progressive, vibrant community with a shared focus that supports pathways for life,” Arlene says. Some artists are involved with The Cargo Shed, an exhibition space, performance venue and art market managed by Creative Tauranga. Others are involved with The Pivotal Artists, a creative group connected with Turning Point Trust. In March 2010, the inaugural Pivotal Exhibition was held at Creative Tauranga. 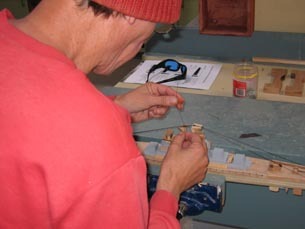 The Pivotal Artists were also involved in Tauranga’s inaugural art fair, held in downtown Tauranga in March 2011. Several artists will be submitting their artworks into the Museum of Everything, a London-based (but virtual) museum that showcases “the odd, the spectacular and the extraordinary”, and celebrates “the creativity of makers kept outside the art realm”, according to its website. The Museum of Everything also holds annual exhibitions in physical spaces such as the Tate Museum. 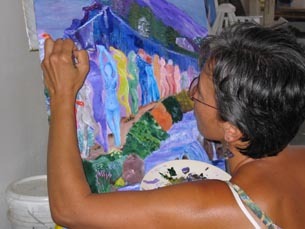 Approximately 25 per cent of Turning Point’s programmes are dedicated to the arts, situated at its studio and Mind’s Eye Gallery. Up to 20 people a day use the studio. “The studio transforms into a gallery, and vice versa. It’s great because we get ever-changing exhibitions,” Arlene says. Other programmes available range from laughing yoga courses to vocational and peer support services. All programmes focus on the same objective, which is mental health recovery. Original generation time 1.3837 seconds. Cache Loaded in: 0.0004 seconds.